The distributor performs a dual function. 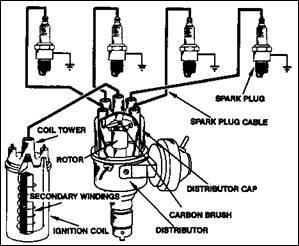 It forms part of the primary circuit of the ignition system and determines when the sparks should occur at the sparking plugs. It also forms part of the secondary circuit of the ignition system and distributes high voltage to the sparking plugs in the correct firing order. An electronic distributor performs the same functions as a contact breaker type distributor. The secondary circuit is similar, but the primary circuit is quite different. An electronic distributor must be installed into a Negative to Earth electrical system. The electronic distributor that suits the Jowett installation is a Toyodenso from a 1982 Honda Civic. For an optimum installation, some changes to the distributor body and drive shaft are recommended. More detail on this later on. Above: In electronic ignition, a pulse is generated each time a tooth of the reluctor passes the pole of the pick-up coil. The distributor used with electronic ignition performs the same functions as those performed by a contact breaker type distributor, but an electronic sensor is used instead of 'make and break' points. The sensor determines when a spark should occur and a transistor, used as a switching device, breaks the ignition coil primary circuit to produce a high voltage for the spark. The rotor and distributor cap perform the normal function of distributing the voltage to the sparking plugs. The sensor consists of a reluctor, or signal rotor on the distributor shaft, and a pick-up coil on the distributor housing, which form a pulse generator. 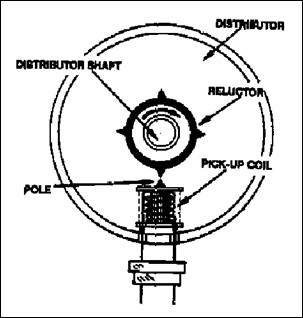 As the distributor shaft rotates, teeth on the reluctor pass the pole of the pick-up coil and a small electric pulse is generated each time this occurs. The reluctor has one tooth for each cylinder of the engine. The ignition system has an electronic control module, also called an igniter, to which the pulse signal is directed. Whenever a pulse is received, a transistor in the control module opens the primary circuit to produce a spark from the ignition coil. The transistor is merely an electronic switch which performs the same function as the 'make and break' points in a contact breaker ignition system. The pulse generator which has been briefly described, is known as an inductive pulse generator. Above: The secondary circuit produces a high voltage and distributes it to the sparking plugs. The secondary circuit of the distributor is responsible for distributing the high voltage produced in the ignition coil to the sparking plugs. The distributor is fitted with a moulded plastic cap which carries the high tension cables. The cable in the centre post in the cap is connected to the ignition coil and this carries high voltage from the coil to the distributor. The sparking plug cables are located around the cap in engine firing order and connected to the sparking plugs. The distributor cap is secured to the distributor housing with two Allen head setscrews, and the cap is sealed against water ingress by a rubber gasket. The rotor arm, located inside the distributor on top of the distributor drive shaft, rotates with the shaft to distribute high voltage to each sparking plug cable post in turn. The high voltage produces a spark across the electrodes of the sparking plug to ignite the air-fuel mixture in the cylinder. The Jowett engine employs the firing order of 1-4-2-3. This firing order is marked clearly on the motor car's chassis identification plate. The distributor cap has an embossed '1' adjacent to the sparking plug cable post for that cylinder. 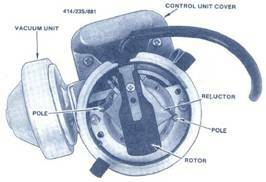 The rotor arm, when viewed from above, rotates anti-clockwise and the other cables are connected in the continuing firing order 4, 2, 3 from number one cable post. The Toyodenso TD-03D is, very likely, the most desirable distributor specification. That model was not readily available, and a TD-03E was obtained, therefore the advance characteristics were set to match the last Jowett Cars Limited specification. At the same time the distributor was mechanically overhauled. The Toyodenso and Lucas distributor bodies are virtually identical. However, the Toyodenso features a longer shank for mounting into the engine. As a result, the drive shaft is correspondingly longer. The sketch at right, illustrates the dimensions that the Toyodenso unit can be modified to, so that it can be installed directly into the Jowett engine. Item 'C' is the mounting plate, also known as the adjustment plate, that is secured to the base of the distributor housing. A new plate was made from 4 mm thick aluminium plate. Care needs to be taken when making the adjustment plate, because its final shape has to be determined from whether the engine's front timing cover has the adjuster plate lug aligned at right angles to the engine centre line (earlier models with DKY type distributor), or, if the cover has two lugs aligned parallel with the engine centreline (Series III front timing cover for Lucas DM-2 type distributor). Start with a larger than required flat plate, and mark out the hole for the distributor mounting spigot to pass through. Next, mark out the hole for securing the adjuster plate to the distributor housing. This hole is for a brass 5 mm diameter by 10 mm countersunk head setscrew. With the adjuster plate attached to the base of the distributor housing, mark out the curved slot in the plate, so that, when installed, the distributor assembly will be free to pivot on the timing cover flange. Make the slot of generous length, to provide plenty of adjustment when setting the ignition timing. At this stage it is a good idea to mount the distributor assembly to check that, particularly on the Jupiter engine, there is generous clearance at the water pump. The best position is with the vacuum unit facing towards the rear. This positioning provides maximum swing of the distributor for ignition timing adjustment purposes. Once the adjustment slot position has been determined, and the slot has been cut, the adjuster plate can be 'slimmed' to match the timing cover flange, but still covers the two breather holes in the sides of the housing. Depending on whether the original distributor was a DKY type or a DM-2 type, there will be a differing drive slot orientation at the oil pump shaft. Essentially, this does not matter – a distributor with an unpinned drive dog can be set in any position. It is important that the distributor shaft is set so that the metal end of the rotor arm is pointing to number one cylinder sparking plug cable post in the cap. This aligns the reluctor with the pick-up pole. There is a thrust washer between the drive dog and the distributor mounting spigot The Lucas drive dog should be a snug fit on the Toyodenso shaft, make sure that it is just loose enough to let the drive shaft turn in it when the rotor is turned. If it is very loose, find a better fitting drive dog, or use a piece of Blue-tack to semi-glue it to the shaft. 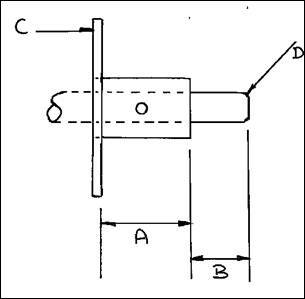 Set the engine to top dead centre (TDC) on the firing stroke at number one cylinder. With the Jowett drive shaft, Part Number 50882 attached to the dog by its circlip, carefully install the assembly into the engine. Hold the housing in the position that was determined to provide clearance at the water pump body. Gently rotate the rotor arm, until the tongue of the drive shaft engages in the oil pump shaft coupling. The distributor should drop into its home position. Carefully rotate the rotor arm so that the distributor shaft slips in the drive dog, until the metal end of the rotor arm is pointing at the cable post for number one sparking plug. Without disturbing the rotor arm or the drive dog on its shaft, lift the distributor out of the engine, place the dog in a drill bench vee block and drill through the dog and shaft with a 1/8" diameter drill. There should be 0.002" to 0.005" end float at the distributor drive shaft after the dog is pinned. Clean away any residual swarf and drive in a spring tension pin, Part Number 50615 from club stock, making sure that the split side is facing the direction of rotation. Above is shown a typical electronic distributor with the cap removed. It is neither the Toyodenso TD-03D nor the TD-03E, but it ably illustrates the main components of the electronic distributor. Before tightening the adjuster plate securing screw, apply a drop of Loctite Studloc 262 under the countersunk head of the setscrew. Fully tighten the screw. Do not allow the Loctite liquid to migrate along the thread, otherwise setscrew removal in future will be extremely difficult. 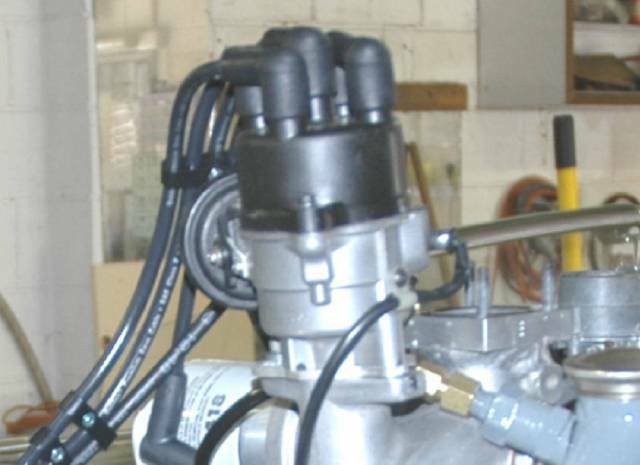 The distributor can then be installed, with the rotor arm pointing directly at number one cable post; with the engine set to TDC firing on number one cylinder. Lock the adjuster plate in this position and rotate the crankshaft through two revolutions and recheck the timing again. If it is not quite correct, slacken off the adjuster plate nut and rotate the distributor housing until the reluctor points align with the poles in the body. Tighten the adjuster plate nut. The engine should start and run at this setting. NOTE: It is important to be aware that, due to the electronic ignition system’s characteristics, the use of a ‘cheap’ ignition timing light , there will be seen to be an advance of 44° to 48° degrees of advance as the engine revs rise. There is no cause for alarm when such advance is observed. It is best to set the static timing and then adjust under road test conditions as stated in the Jowett Maintenance Manual. The ignition control module should be mounted on a bracket, away from engine vibration and in a relatively cool area. On the Jupiter, it was found that an angle bracket suspended from the RHS horn mounting was ideal. Keep the cable away from the engine cooling fan. Ignition modules (also called igniters) are sensitive electronic components and require careful location, away from heat and moisture to ensure optimum performance in the areas of Dwell Control, Primary Current Control and Primary Induced Voltage Clamping. Efficient primary current / dwell control is very important in order to get the most energy from the ignition coil. Insufficient current I dwell leads to Iow ignition coil output resulting in difficult starting, breaking down under load and misfiring at high rpm. Excessive current dwell leads to overheating of ignition coil and the ignition module, causing premature module failure and possible damage to other vehicle components. Excessive primary induced voltage leads to possible damage to coil and modules as well as other components connected to coil negative such as tachometers, security systems and LPG safety switches and closed loop controllers.